Office—Word, Excel, PowerPoint, the old frenemies—are out of beta and ready to buy. Sort of: you buy the newest version of Office like you buy Netflix or Spotify, with a subscription. And it makes a hell of a lot of sense. 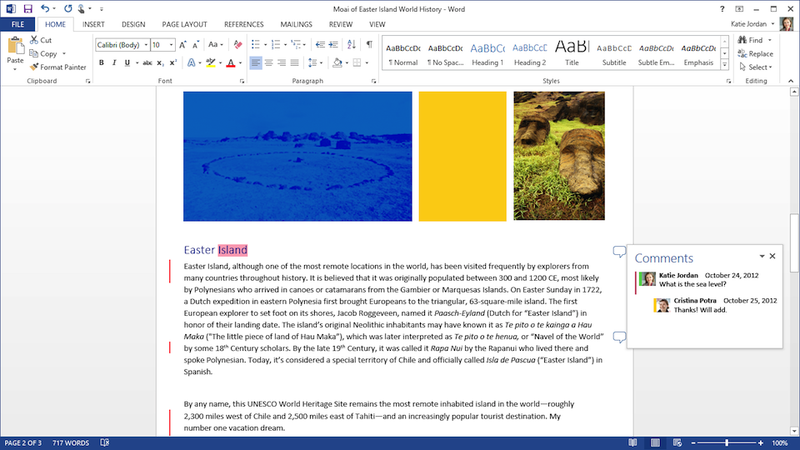 Microsoft Office is usually a big purchase, or no purchase at all—sometimes it comes with your computer, or sometimes you'd have to shell out for the latest version. Not anymore: Office 365 Home Premium, which includes the kitchen sink, doesn't need to come on a couple-hundred-dollar disc. You can pay for Office for as long as you need it, going month by month (for $10 a month) or pay $100 for a year upfront (and save a little). Either way, you'll get a lot more from Microsoft than you have in the past: the entire suite (2013 on Windows, 2011 on a Mac) can be installed across five devices simultaneously (tablets, laptops, whatever), streaming versions of whichever application you happen to need can be beamed to any computer you're on with an Internet connection, and all of your files will be synced as you work, whether you edit them on Office.com, your tablet, or your Windows Phone (if you've got one). You'll even pick up an extra 20 GB of SkyDrive storage and an hour of free global Skype calling each month. The subscription also incudes upgrades to any future versions of the suite, so you don't need to fret about upgrade discs. A four year, broke student "University" subscription will also be on the table for a very binge drinking-friendly $80. If this sharing, streaming thing sounds like some sort of socialist plot to you, you cans pay a flat $140 for the home or $220 for the business editions, locking them to a single computer for all eternity. OK, yes, it's still Office. It's the best version of Office—touch-friendly, simplified, less horrific on the eyes—but it's still that software you have to use for work. Check out our hands-on here. But odds are Office isn't an interesting choice for you, but a reality, just part of being a productive part of society that needs to mess around with .doc files like all the rest of us stiffs. This isn't going to be the most exciting change in your life. But it'll be a welcome one. Microsoft spread across all of your computer, the web, and (maybe) your phone makes sense. Paying for it while you feel like owning it makes sense—you'll keep all your documents if you decide to go elsewhere, don't worry. Being able to stream the software to computers off your beaten path makes sense. And not having to futz around with upgrades is just lovely. If you want Office, keep feeding the meter, and the rest should be pretty smooth. You can pick it up here, today.